- Nghe An Green Hotel is Vinh City centre, near railway station, airport and 12 km far from Kim Lien Vestigial Zone-Great Ho Chi Minh presidents homeland in the west; in 12 km distance to Cua Lo tourism Beach in the east; 13 km to Nguyen Du Great Poets homeland and tomb in the South eat. - Nghe An Green Hotel is satisfied three stars standards with 84 spacious and comfortable bedrooms; the hotel has thee large dinning rooms possible of serve for 1.000 dinnerparty by Asian, Eoropean dishes, special dishes, meetinf haslls with 20 - 500 seats capacity, French modern swimming-pool, advanced steam bath system, high speed internet services, tourism cars 4 - 45 seats to meetdistinguished guests to visit Nghe An famus landscapes. The hotel also has whole-hearted skilled group of staff and workers. 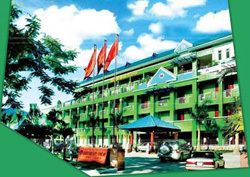 - Nghe An Green Hotel is a trustworthy address in province. Our hotel services shall satisfy all requirements of distinguished guests. We are very pleased to be served distinguished guests! Lobby and Moonlight Bar: The unique place in town offering a widechoice of cocktails and seasonable fruit juice. Thai massage with the most luxurious and modern equipment at present shall offer all of visitors following sevices. - Dry and wet sauna. - Hydraulic weter jet bathroon, massage weter tanks. - Massage rooms for VIP. Our competent staff are ready to offer . An ideal venue which offer a conducive atmostphere for bussiness.Uor friendly and attentive staff are ready to serve you.Come and pampered!